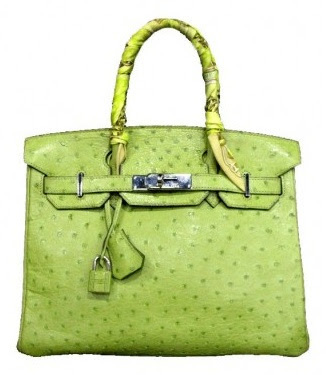 This lime green ostrich Birkin Bag. Found it on Portero. Can you imagine? Let's all bask in its glory. The handles are hand wrapped with an Hermès scarf (done at the Hermès for $600). It's too luxurious for its own good; check it out on Portero, I can't bear to tell you the price.